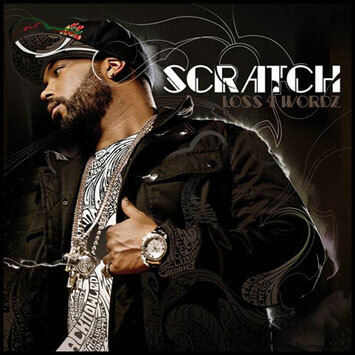 Loss For Wordz is Scratch's introduction to a new audience. Although his beatboxing is still the foundation, singers predominate, melodies are pushed out front by a supporting cast of traditional instruments and the vast array of beats and sound effects at the disposal of this man's extraordinary mouth offer guidance and decoration rather than an overwhelming barrage of verbal trickery. "I wanted the tracks to be as simple as possible, but also to sound full. That's why I brought these instruments in, to provide new colours but still keep the simplicity." To anyone wondering where Scratch, beatboxer extraordinaire and erstwhile member of The Roots, has been in the five years since his debut album, he's been busy clambering out of a couple of boxes. The first will be familiar to anyone who has ever groaned at the prospect of an entire album from an 'instrument' usually restricted to a sideshow. "You can't just walk into a place and say, 'This is the beatbox record my man made, check it out.' Most people won't be interested, they think it's a limited thing," he admits. The other aim was to dispel the preconceptions that go with being a member of Philadelphia's finest, and most durable, rap outfit. He says, "I didn't want people saying it was like a Roots record would be, one where I run out and get Common or Mos Def, working in that same circle." Fortunately, the solution to both problems was the same: to make an album that sounds like Scratch without sounding like anything he's done before. So the guest list features the obscure (Jonas Myron) and the famous (Kanye West), the expected (old Philly friend, Musiq Soulchild), the adventurous (Damon Albarn) and the completely unanticipated (yes, that is the Daniel Bedingfield). "It's been almost three years in the making, because there were certain people who had to be on the record for me to accomplish what I wanted. I didn't just want to go out and make a typical record that you would expect from me. I wanted to make something that I was feeling from far inside, that this is a part of me, not just part of the circle of The Roots," he states. Not that there's any bad blood between Scratch and the group he left five years ago: he was on their recent Rising Down album and still performs the occasional show. But having released his debut album, The Embodiment Of Experimentation in 2003, only to find The Roots' touring schedule effectively precluded any outside promotional work ("when you're in a group that does a minimum of 250 shows a year, it's pretty hard to do anything for yourself"), he was in need of a little 'me time'. The Scratch story began in Camden, New Jersey, a small town with a huge crime rate (it was named America's most dangerous city in 2004-05). The young Scratch benefited from a strict mother who confined him to two hours of TV a day and insisted he read a book a week, penning a summary of the story when he'd finished it. "She always preached that she raised no dummies," he says. "And for that I thank her. I did my best to stay away from hanging out on the corner and made a decision about what I wanted to do with my life." That decision meant moving to Philadelphia, New York being both too expensive and its hip hop scene too overloaded. In Philly it was easier to get noticed and in The Roots the city had an identifiable, though not identikit, sound and nurturing spirit. "There were a lot of eyes upon the city, a lot of up and coming artists. It had a vibe to it, a sense of community about it. A lot of the artists who came from there, came through The Roots: Jill Scott, Beanie Siegel, Musiq Soulchild." Making his debut on 1996's Illadelph Halflife with the strictly drums-and-beatbox ? vs Scratch, on which he sparred with bandleader ?uestlove, he quickly became a fixture of the world's most popular and influential touring rap group. The Embodiment Of Instrumentation received rave reviews, despite being designed, as the world's first all-beatbox album, with a technical 'wow' rather than commercial impact in mind. Simple it may be, but Loss For Wordz is also dizzying in its diversity. After the ferocious blast-off of Peedi Crakk's Let's Go , you're plunged headfirst into the soothing waters of the delicious Tonite, featuring neo-soul legend Musiq Soulchild. Then it's onto the hi-tec R&B of If Our Love Was A Song, the album's most surprising hook-up. Scratch initially only knew Daniel Bedingfield as Natasha's brother, but realised just how familiar he was with the man's music when his co-producer Sammy Jay started playing him some. He says, "Daniel has a great voice, very powerful, soulful, he brings a lot to the table and has a very colourful way of doing things. If Our Love… has the edge to it that people would be expecting, up-tempo, a splash of pop and soul." The next star needed no introduction to Scratch, or anyone else. But the beatboxer was impressed and touched by how just approachable Kanye West turned out to be. "I don't care what anyone says about him being arrogant, he's a great person," says Scratch. "He didn't say 'Call my manager, that's gonna cost you this much.' It was as simple as a phone call. I said to just let me know whenever he was available. He said, 'Alright, I can come down tomorrow.' He took down my address and directions, the next day he was there ringing my bell." Ready To Go is among the most experimental tracks on the album, the only all-beatbox number, Kanye sampling Scratch's voice and feeding it through a keyboard to create the melody that buzzes beneath his rhymes.